The Samford University Art Gallery will host seven exhibitions during the 2015-16 academic year featuring a variety of works by renowned visiting artists as well as Samford students, faculty and staff. Gallery Director Robin Snyder said it is important to have diverse two-dimensional and three-dimensional art media displayed so that students are not just exposed to one type of art. The first exhibition, “Reflections of Generosity – Reflections of the Soul” led by Sgt. Ron Kelsey, will take place from Aug. 24-Sept. 29. This exhibition uses essays and artwork by members of America’s armed forces to portray soldiers’ struggles but also instill courage and hope into soldiers and their families preparing for deployment. A portion of the exhibition will also be displayed at Space One Eleven in Birmingham in conjunction with Larry Thompson’s “The Infanttree Project.” Thompson serves as the chair of Samford’s Department of Visual Arts. From Oct. 5-Nov. 15, the photography exhibition, “Faces of Perry County” by Caroline Summers, Samford’s director of photographic services at Samford, will be on display. The photographs will inform viewers about the people and places of Perry County, Alabama, where Samford University was located from its founding in 1841 until its move to Birmingham in the 1880s. The Graduating Senior Art Exhibit Dec. 7-12 will close out 2015 by giving graduating seniors an opportunity to display their senior projects for review by professors, professionals and community members. Nationally-celebrated printmaker Amos Kennedy will open 2016 with an exhibition and sale of his letterpress art Feb. 1-25. This is part of Samford’s Visiting Visual Artist Series. Kennedy will also do an artist talk and demonstration at the closing reception Feb. 25. “Other Forms of Life: Works in Ceramics” by >WangLing Chou will take place from March 1-16. Chou’s art has been accepted into numerous competitive juried shows and has received many honors. The annual Juried Student Art Show will be April 4-26 and will feature students’ art submitted for juror selection. Scholastic and art awards will be presented at the reception on April 26. Seniors will again display their final projects at the spring Graduating Senior Art Exhibit May 9-13. “As visitors come to the Samford Art Gallery, I hope they will be inspired by the creativity as well as excited by the visual stimulation that they find there,” Snyder said. 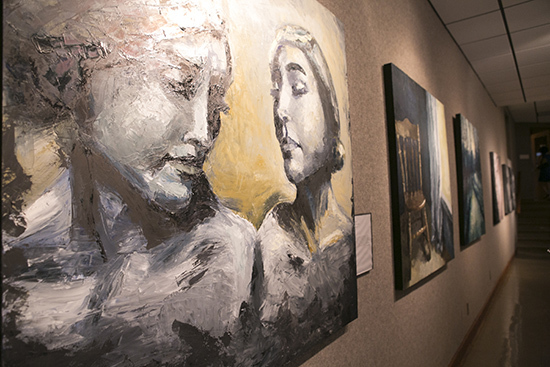 The Samford Art Gallery is located in Swearingen Hall and is open from 9 a.m. – 4 p.m. Monday through Friday.